Since Friday is a working day, if I was going to queue I had to be first in and first out. 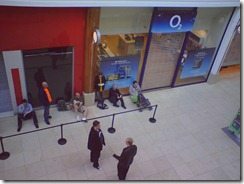 After all, I only wanted a pay as you go phone in a box and I wouldn’t be taking more than a couple of minutes in the store once it opened. 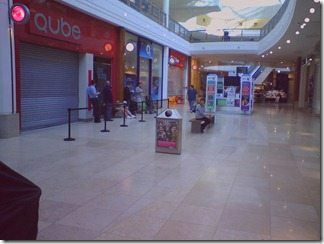 I set off for Festival Place very early and arrived in an empty shopping centre mall shortly before 7am. 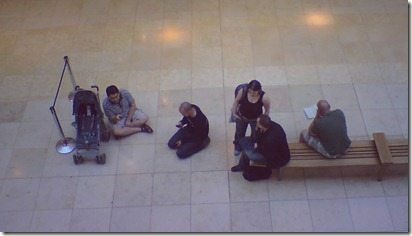 That’s me by the pram (I brought my son for his first iPhone queue), wearing the stripy top and the sandals. [8:00] The queues is starting to build now. I didn’t have a great view from my position but there were around 15-20 people. [8:15] One of the guys from the O2 store comes and offers us chocolate. I personally decline and instead ask for coffee and tea for everybody. O2 guy says there’s not enough milk for everyone. And I wanted a black coffee too, sheesh. 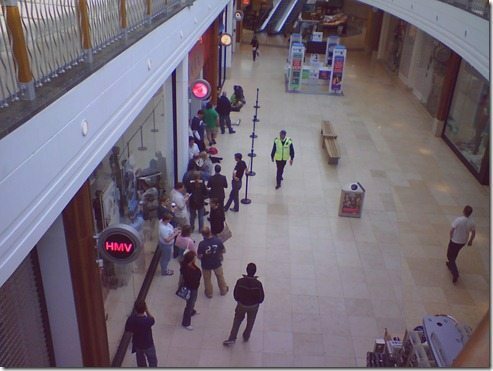 [8:50] The staff appear to be in really good spirits and have a team chat before opening the gates to the horde of hungry Apple fans, perhaps the thought of lots of closing lots of lucrative contracts before lunch will get them through the day. 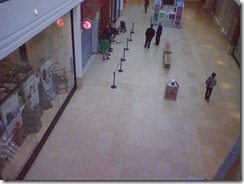 [9:02] The gates open, I’m the first one into the shop! [9:07] With my choice of phone size and colour I went for a 16gb iPhone 3Gs in white. And I am pleased. 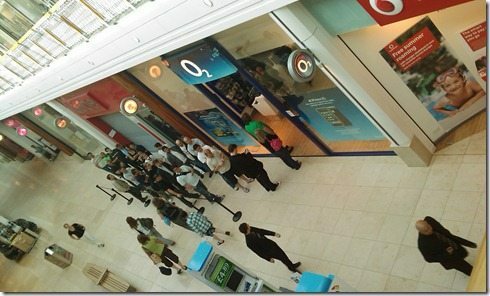 Shortly after I left, I am told that a Basingstoke Gazette reporter arrived on the scene to take people’s pictures and report on the queue. He/she was an hour or two late; no iPhones for the photographer then. Next Post Switch your bookmarks! Well, Mike, you are a real Mac-fan 🙂 I’m always shocked when watching news about people in iPhone lines. 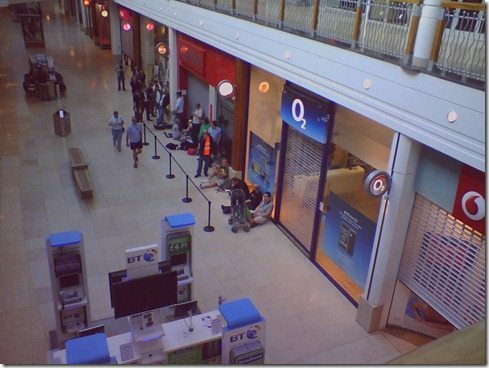 I cannot imagine myself staying for several hours in a line to just buy a mobile phone. Apple is likely a religion!